There is something about Autumn that makes you think of hedgehog and Squirrel crafts and since we have done a few squirrel crafts we thought we would have a go at some hedgehogs. Everyone has been feeling a bit tired so we decided to stick with a template. We used the Activity Village Hedgehog colouring page as our template – I purposely choose this as the template as the kids have been using the Learn How to Draw pages over the last few days and the hedgehog in the drawing pages is the same as the hedgehog in the colouring page so I thought the consistency would be a good thing. We tried 2 different versions. First we had some fun creating a Sand Art hedgehog. We just used normal Pritt for this and our Coloured Sand bottles (my kids find it easier to pour the sand out of the bottles into smaller plastic cups so they can better control the amount of sand they apply to their pictures). After we had finished our hedgehogs the kids commented that the eyes looked a bit strange (they were hidden under the sand). So we tried adding some googly eyes that we had. We also had made more multi-coloured hedgehogs. And we had a go at making a coloured paper hedgehog. The kids cut out a strip of grass to go at the hedgehogs feet and realized that the snippets of paper that we had cut out were triangular in shape and wondered if they could add it to the hedgehog as it’s prickles. So we cut some more “grassy strips” in orange and yellow and then glued the off-cuts onto the hedgehogs body. I must admit I really like the effect the paper gives the hedgehog (on this one my daughter used her oil pastels to add in the background). I Love our little hedgehogs. 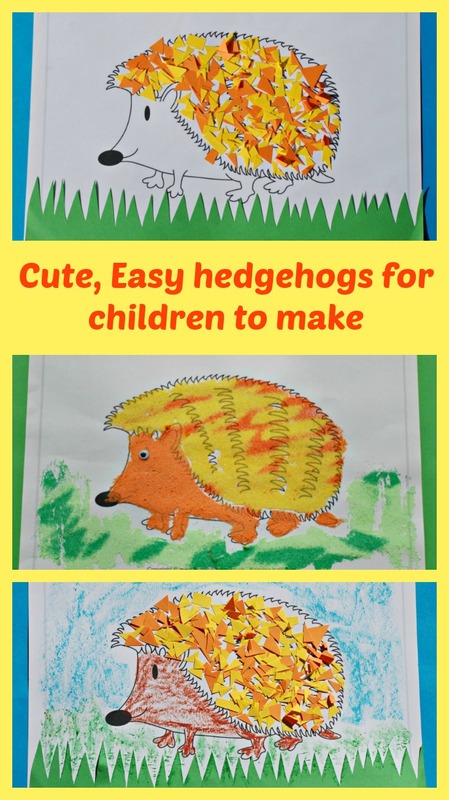 This entry was posted in Art and Craft Ideas and tagged activity village, Autumn crafts, children's craft, hedgehogs, home education, homeschooling, paper craft, sand art. Bookmark the permalink. These are adorable! I like the different mediums used.